I'm a lover of the classics. I saw North and South several years ago and I was...ah-mazed. I mean Holy Hotness Mr. Thornton! Be still my heart. 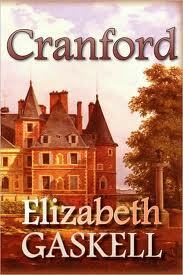 Ever since I have been obsessed with Elizabeth Gaskell. I've yet to read Cranford, but I did see the film. SO good! I mean, Judy Dench is in it. How can it not be good if she's in it?! It is actually very funny. Several laughable parts! I just downloaded this classic on my Kindle and I can't wait to get started. “Out of the way! We are in the throes of an exceptional emergency! This is no occassion for sport- there is lace at stake!" Lol - makes me laugh. I really want to read this - I loved the BBC adaptation of it! I'm crazy over the BBC adaptation! Isn't it funny?! Elizabeth Gaskell is pretty funny! LOL, love the last line of the second one.